'Bohemian Rhapsody', the biopic based on the life of Queen frontman Freddie Mercury has unveiled its first trailer. The clip sees 'Mr. Robot' actor, Rami Malek as Mercury and showcases some of the legend's most iconic moments. The production was initially shrouded in controversy after a series of accusations of sexual abuse were made against Bryan Singer, the original director. As a result, production had to stop whilst a replacement was found, luckily, Dexter Fletcher was on hand to take up the position and finish the film. Now, about six months from the biopic's November release date, a first trailer has dropped. Take a look at the clip below, and get a good look at Rami Malek in character as he sings and dances across the stage alongside his Queen bandmates. 'Bohemian Rhapsody' is as much about Queen as it is about its frontman, Freddie Mercury, who made his name by defying norms and becoming one of the most cherished showmen in musical history. The film sees the band's rise to fame through its revolutionary music, the effect this had on Mercury's personal life and finally, thee Live Aid concert. British actor Sacha Baron Cohen was initially cast in the role of Freddie Mercury, and if we're honest, we can't fault the choice. 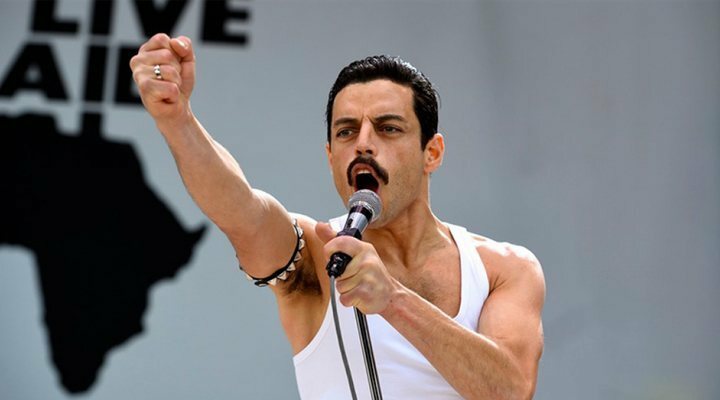 However, once the self-professed Queen fan confirmed his role came Rami Malek, an actor with an undeniable physical likeness to the musical legend. 'Bohemian Rhapsody' is set for UK release on 24th October, just in time for awards season in early 2019. Will Malek be able to wow audiences enough to bag himself an Oscar nomination? We wonder. We've a long way to go yet, but, at least we've got the trailer to amp up our anticipation.